Research suggests that business schools are not adequately preparing students to meet the challenges of climate change. Sustainability-focused pedagogy is rare. Even rarer are schools that teach science-based sustainability strategies. As the primary drivers of climate change, the role of the business community is crucial. Business and industry are the largest contributors of greenhouse gases that are driving climate change. According to some estimates, this translates to a 6 percent for buildings and 25 percent for electricity production. Almost all companies have inculcated emissions reduction into their sustainability strategies. However future leaders are not getting the education they need to ensure that business and industry do what they must to augur the required changes. In April Nancy E. Landrum, Professor of Sustainable Business Management, Loyola University Chicago published an article in which she discusses her research. 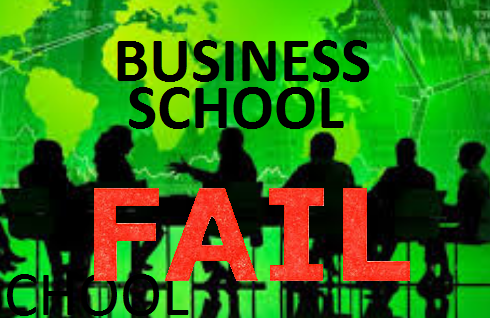 She bluntly concluded that business schools are failing on climate change. According to Landrum, "sustainable business courses across the U.S. do not align with the scientific consensus that we need radical change to avert disastrous consequences of climate change. These future business leaders are not being prepared for the climate change challenges their companies are certain to face." Businesses need to heed the science if we are to see reductions in greenhouse gas emissions sufficient to keep us within the 1.5 - 2 degrees Celsius upper threshold limits. Companies need to reexamine their carbon budgets and adopt science-based emissions reduction targets. We must restrict total emissions to no more than one trillion metric tons. That means that we need to see a reduction of 49 to 72 percent globally from 2010 levels. The US will have to double its current commitment of 26 - 28 percent reductions. It should be noted that these reductions become voluntary in the context of the Trump administration's withdrawal from the Paris Climate Agreement. Landrum sees emissions reduction as entirely compatible with growth. She cites the example of California which is working to radically reduce its emissions while enjoying significant growth. California has enacted laws related to greenhouse gas emissions, clean air, vehicle emissions, and energy efficiency standards. Indeed there is strong evidence for the decoupling of emissions reduction and growth. While businesses are acting Landrum states that they are, "simply failing to grasp the deep change that is needed. There is a huge gap between the path we are on and where the science shows we need to be." Some companies have adopted science-based emissions reduction targets but they are the exception to the rule. The new generation of leaders currently in business schools will be tasked with helping companies to harmonize their GHG reduction goals with science. However, recent research indicates that the majority of business schools do not offer any type of sustainability-focused education let alone information related to GHG reduction. The schools that do offer sustainability in their curricula are doing a poor job of preparing their students for the future. Landrum studied 51 US schools at the forefront of the business of environmental sustainability. She found that not all schools offer an introductory sustainable business course and those that do offer it as an elective. Only a few business schools offer minors, majors, certificates or graduate degrees in sustainability management or sustainable business. There is also very little standardization. The 81 introductory sustainable business courses had 88 different readings. More than half (55%) of sustainability readings assigned to business students took a weak sustainability position. These readings suggested a business-as-usual approach with small gradual improvements. The motivation for adopting sustainability in these readings included business benefits of sustainability (i.e., increased innovation, competitiveness and profitability) or the need to do what is required by law (i.e., meeting labor, emissions or pollution regulations). A science derived perspective was present in less than one-third of the readings (29%).